In the spring of 2018, filmmaker David Barrow captured hours of footage of Big Bend National Park, documenting the vast landscapes, intimate details and everything in between in gorgeous time-lapse video. Justin Sherburn and Emily Lofaro have recorded interviews with artists, historians, scientists, poets, tour guides, and anyone passionate about the place.The Legend of Big Bend combines these elements in an epic adventure to the west Texas high desert. This new musical offering by Montopolis takes the group back to its beginnings as an indie chamber orchestra, bringing together Austin Symphony players with seasoned indie rock musicians. Composer Justin Sherburn's new work is influenced by a broad spectrum of American composers from Aaron Copland and Philip Glass to Bob Wills and Dan Deacon. 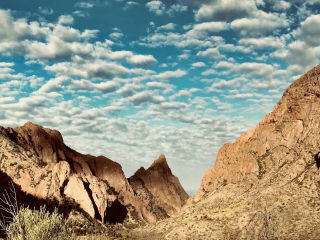 The arrangements combine pedal steel guitar, string trio, horns, and a rhythm section, creating a sound as bold as Big Bend's grand vistas.